(5-6) The brahmin said: 'Moving around on the earth in [a body] that is made of earth, you, oh King also endowed with such an earthly body, recognize an earthly person in me. Why would your grace, with these [carrier's] feet and above them these ankles, calves, knees, thighs, waist, neck, shoulders and upon those shoulders the wooden palanquin upon which a soul sits who is thus known as the King of Sauvîra, have to impose your will in this haughty manner with 'I, the King of Sindhu' and thus have to be a captive of false pride? (7) The way you control these poor, helpless people by mercilessly restraining them with violence and [on top of that even] boast 'I am your protector', you with your impudence cut a sorry figure in the society of the old and wise! (8) Because we as moving or unmoving life forms consist of earth, we are also familiar with the everlasting appearance and disappearance [of our earthly forms]. We only differ in name from each other when we speak of factual behavior. Let us consider how things really are to be inferred. (9) By the words we thus use for worldly matters [for e.g. racial and national distinctions] is that what exists not truthfully described. What one in one's mind imagines of the particular characteristics, the aggregation and the dissolution again in the constituent atomic particles [of returning to 'dust'] of matter, covers but an unconscious, less intelligent notion of existence [see B.G. 13: 23]. (10) Please understand that being meager, fat, tiny or big, existing as an individual entity, inanimate matter or whatever other natural phenomenon of disposition, all concerns impermanence in the name of a certain place, time and activity; a temporary state [inherent] to the operation of nature's duality. (11) The spiritual knowing perfectly pure that constitutes the ultimate goal, is the Oneness without an inside or an outside, the Absolute Truth of the Spirit [Brahman], the inner peace [of the meditator] that in a higher [personal] sense is known as Bhagavân, the Supreme Lord [of all opulence], who by the scholars is called Vâsudeva [the Soul of God within, Vishnu, or Lord Krishna as the son of Vasudeva]. Third revised edition, loaded April 18, 2018. Rahûgana said: 'My respectful obeisances unto you who emanated from the embodiment of the Original Cause [Rishabhadeva, see 5.4], unto you who in his self-realization despises all strife and quarrel, unto you who as a forsaker of the world in the form of a brahmin friend has concealed his realization of the eternal truth. You are like the medicine for a by fever distressed patient, you are like the cool water for someone scorched by the sun and for someone like me, whose vision in this gross body has been poisoned by the serpent of pride, you are the miracle potion of the gods. Now, please explain to me, burning with curiosity, again [in simple words], so that I may clearly understand, your concise speech concerning the yoga of self-realization. Personal matters not clear to me I will submit to you later. The brahmin said: 'Moving around on the earth in [a body] that is made of earth, you, oh King also endowed with such an earthly body, recognize an earthly person in me. Why would your grace, with these [carrier's] feet and above them these ankles, calves, knees, thighs, waist, neck, shoulders and upon those shoulders the wooden palanquin upon which a soul sits who is thus known as the King of Sauvîra, have to impose your will in this haughty manner with 'I, the King of Sindhu' and thus have to be a captive of false pride? The way you control these poor, helpless people by mercilessly restraining them with violence and [on top of that even] boast 'I am your protector', you with your impudence cut a sorry figure in the society of the old and wise! Because we as moving or unmoving life forms consist of earth, we are also familiar with the everlasting appearance and disappearance [of our earthly forms]. We only differ in name from each other when we speak of factual behavior. Let us consider how things really are to be inferred. By the words we thus use for worldly matters [for e.g. racial and national distinctions] is that what exists not truthfully described. What one in one's mind imagines of the particular characteristics, the aggregation and the dissolution again in the constituent atomic particles [of returning to 'dust'] of matter, covers but an unconscious, less intelligent notion of existence [see B.G. 13: 23]. The spiritual knowing perfectly pure that constitutes the ultimate goal, is the Oneness without an inside or an outside, the Absolute Truth of the Spirit [Brahman], the inner peace [of the meditator] that in a higher [personal] sense is known as Bhagavân, the Supreme Lord [of all opulence], who by the scholars is called Vâsudeva [the Soul of God within, Vishnu, or Lord Krishna as the son of Vasudeva]. Dear King Rahûgana, this cannot be realized by [just] doing penance, by deity worship or by putting an end to one's material activities, nor by one's household life, by celibacy and study or by self-restraint in relation to water, fire or the sun [alone]. This is not revealed unless one smears the dust of the lotus feet of the great examples all over one's body! There where the qualities of Him praised in the scriptures are discussed, worldly concerns find their end. When one day after day seriously listens to those whose purpose it is to find liberation [in devotional service], one's meditation will durably be turned to Vâsudeva. 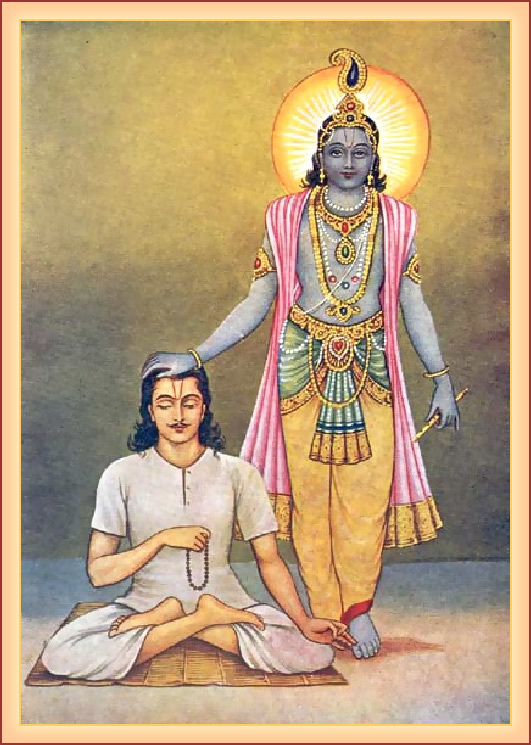 In a previous birth I was known as a king named Bharata who found liberation through personal insight and association in worship of the Supreme Lord. Thus always engaged, I [nevertheless] became a deer [in my next life] because I, intimately associated with one, had neglected my duties. Despite being a deer, oh great hero, the memory of my activities of worship unto Krishna [the Lord as the One known by His dark skin] did not leave me. For that reason I, out of fear moving about unseen, [now] keep myself far from associating with ordinary folk. The picture is a vintage Gîtâ illustration titled: "Reward of exclusive thought" Artist unknown.